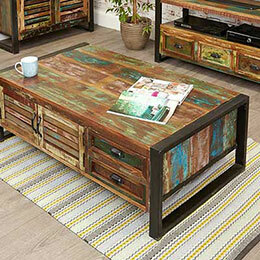 Stylish designer modern wooden furniture - Quality living room furniture, bedroom, dining room and versatile home office furniture. Manufactured from solid hardwoods such as sheesham, mango, oak and walnut all of which have been obtained from, environmentally friendly, sustainable sources. 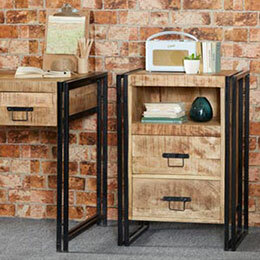 Beautifully designed and crafted our retro and contemporary wood furniture collections are a marriage of practicality and style at very affordable prices. 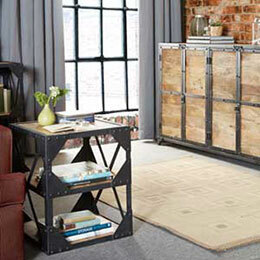 See the latest contemporary design in our Cuba Cube and Mayan collections. Enjoy art deco design in our Retro and Shiro collections. Buy online - UK stock - Quick Delivery. Shiro - The Shiro walnut range is hand made using the best solid walnut and oozes art deco retro modernism but is designed for the 21st century. 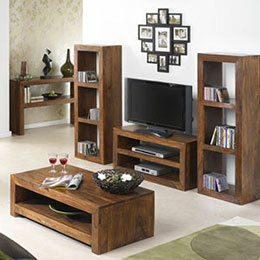 This range has been specifically designed for the lounge or home office and will truly enrich these spaces. 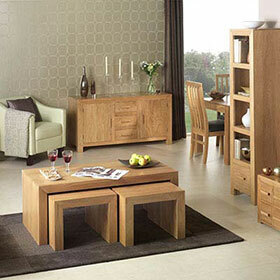 Cuba Cube Oak Living Room Furniture - This stylish contemporary modern collection is hand crafted from solid American white oak. It is simple and modern, chunky with clean, straight geometric lines. Retro Furniture - Our retro 1920's to 1970's collection features quality reproduction versions of timeless classics from the early days of modernity. THIS RANGE IS ALSO AVAILABLE FOR SALE IN HONG KONG. 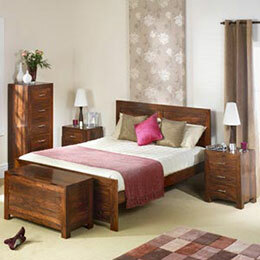 Timbers - We use a variety of the best quality timbers in the construction of our traditional furniture collections. 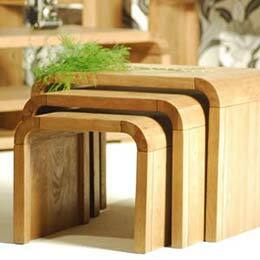 Each timber is carefully selected from sustainable and managed sources in Europe & Asia. 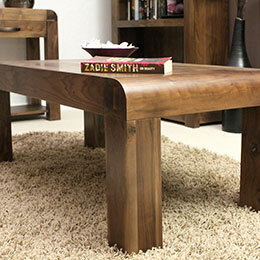 All timbers are solid and we manufacture using oak, pine, walnut, mahogany, elm and mango. 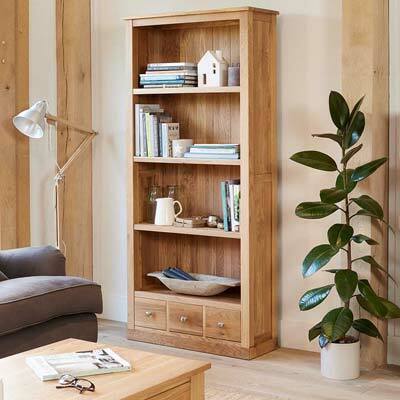 Caring for your furniture - Wood is a natural material and reacts to the environment it is in, do not place in direct sunlight or positions exposed to extremes of heat or humidity. To care for your furniture we recommend using a clear wax furniture polish; spills should be wiped up immediately, scratches or marks can be covered using a brown wax polish. 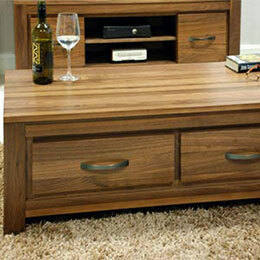 Caring for your furniture will ensure lasting pleasure for many years to come. An oak tree belongs the genus Quercus. There are around 600 existing species of oaks. 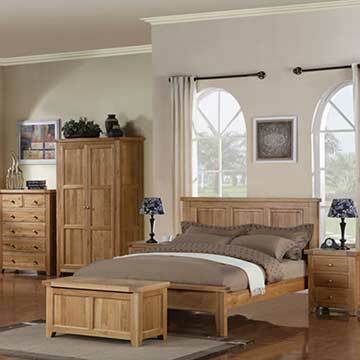 Oak is native to the northern hemisphere, and incorporates deciduous and evergreen species thriving in cool to tropical climates in the Americas, Asia, China, Europe and North Africa. Oak is a highly favoured hardwood because it is attractive, dense and very hard wearing, providing strength and reliability. 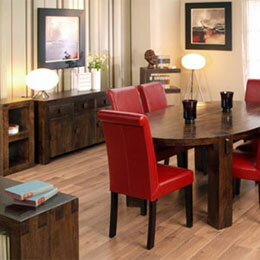 It has alluring open wood grain markings with pleasing colour tones. Oak has two predominant shades; white oak, which is grey/brown in colour or red oak which is akin but with a prominent reddish tint. 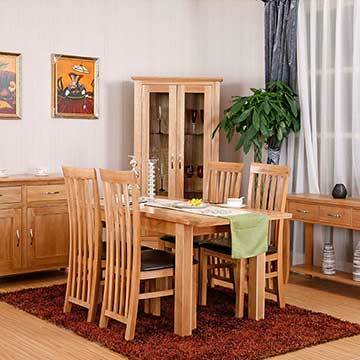 Why is oak so popular for cabinet making? For centuries oak been used in the construction of fine solid oak furniture because of these unique features. 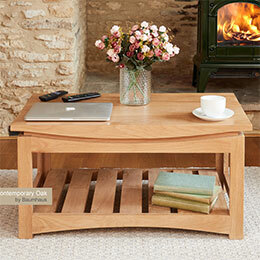 Solid oak furniture should always be built to traditional high standards. Using these techniques that are centuries old, proficient craftsmen can make oak furniture which is naturally beautiful, robust and hard wearing. 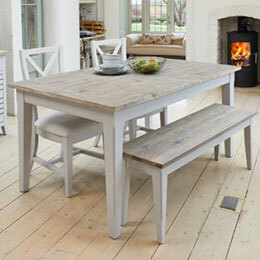 The delightful grain of the solid oak timber can be intensified by the design of the oak furniture itself to display the oak wood at its optimal, natural best. It should be finished with natural furniture wax. The origins of modern furniture date back to the late 19th century with a new design philosophy being influenced by modernism and technical development. In just a few years furniture design was radically changed and so different from all that was before. Ornately carved and turned wood along with ornately patterned fabrics gave way to geometric simplicity, smooth lines, chrome metals and modern fabric designs - Evolving from visually heavy to visually light. Designers have produced many new styles over the generations. Design considered fresh and new, say, in the 1920's and 1970's is today somewhat less modern in appearance and is often considered retro. 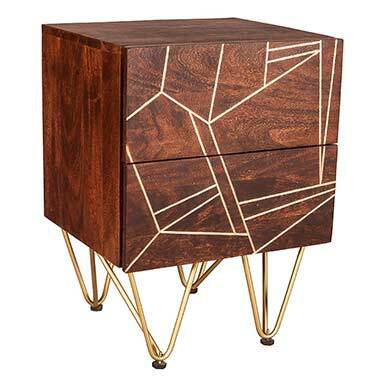 Modern furniture these days has much in common with similar features as these retro designs, but with a much more modern twist and more technologically advanced materials. 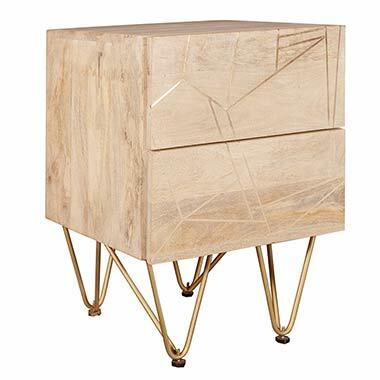 Contemporary modern furniture usually features crisp, clean, lines with chunky finishing or smooth curvatures and has a very geometric design. Many materials are used including smoothly finished fine grained woods, man-made particle boards, metals, plastics and other easily fashioned functional materials along with leather and modern style fabrics. In the earlier years of modernism the use of new innovative materials, such as steel, molded plywood, laminates and plastics spearheaded the creation of new designs and concepts and were considered pioneering. To some traditionalist people it was shocking, however, this interest produced a new blend combining the disciplines of technology and art. There was, and still is, a wide range of influences affecting contemporary and modern furniture design. Before the modernist design movement furniture was expected to be a desirable ornament of beauty with value gained due to the length of production and it's intricate details. The new 20th Century philosophy changed these rules with the emphasis on function. The modernist design movement did look back to the past however - But not the Western past, it looked to the Orient for inspiration. A combination of influences appears to have helped modern design evolve - Innovative materials, new manufacturing methods, new philosophies and inspiration taken from Japanese design. The strikingly simple Japanese design was first commonly seen is the West towards the end of the 19th century and the artifacts that emerged were soon extremely popular and had a massive influence of modern furniture design over the next years. Their use of solid colours without decoration and vivid contrast caught the public imagination and "Japonism" swept across Europe. It is even said to have influenced Art Nouveau and Art Deco. 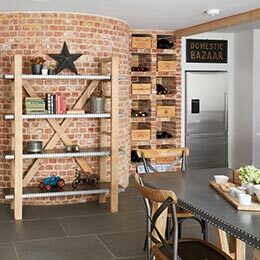 As design and technology evolve we can expect to see many new, innovative and creative designs in the future. Some will look back to look forward, like fashion and some will be entirely new, like printed furniture - Where it's entire construction is printed! Yes I did say 'printed' - That was not a typo!